In February of 2012, I set out to do what I refer to as “The Sock Challenge”. The goal was to photograph every pair of socks that I wore that month and make new designs based on them. Well, technically I failed. In my mind I was going to make a new design everyday in the month of February! Didn’t happen. Although I have managed to do a few designs based on this challenge. For some examples, see previous posts The Story of…Bears Flying Planes, The Story of…Polar Bear Eating Ice Cream, The Story of…Stripes in Gray, The Story of..Bokeh Inspired Hearts and The Story of…Grim Reaper with Flower. Every once in a while, I decide that I should finish that challenge and continue creating designs based on the socks I wore in February 2012. Honestly, I thought I had photographed every pair I wore that month. It turns out I was wrong. For one reason or another, there is a day that is missing a sock photograph! Though, I felt I couldn’t just skip over this day since I had done every other one until that point and thus… Missing You Socks was born! For some reason whenever I look at this design, the song Missing You by John Waite pops into my head. The text on the front of the Missing You Socks card on Zazzle(along with the inside text) is customizable. 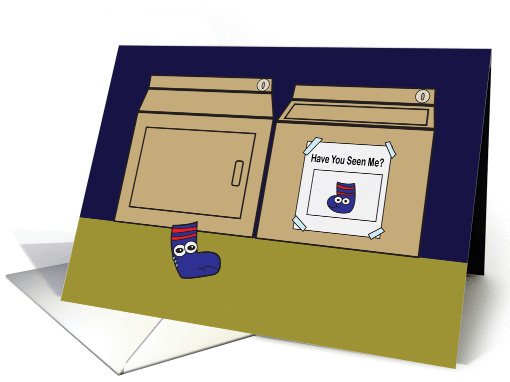 Only the inside text on the inside Missing You Socks card on Greeting Card Universe is customizable. The day of the missing sock photograph is February 8. Just realized I admitted to being wrong and failing in the same post. Ouch! Ha ha. Has there been a time that you’ve been able to make a mistake work for you? Let us know in the comments! This entry was posted in The Story of... and tagged art, art work, Greeting Card Universe, Missing You, missing you cards, missing you greeting cards, missing you socks, socks, Valerie's Gallery, Valerie's Gallery on Greeting Card Universe, Valerie's Gallery on Zazzle, zazzle by Valerie. Bookmark the permalink.